Selling for roughly three times the price of a Linn LP12, the PL-L1000 was a beautiful machine, engineered to the very highest standards. One touch of its controls, and you just can’t fail to be impressed by the quality – from the turn-wheel tonearm cueing control to the crisp, muted ‘click’ of the lift/lower microswitch. That parallel tracking tonearm is brilliantly done, but it’s nowhere near as fussy as many modern designs – it glides silently across the disc, tracks securely and returns to its rest silently at the end of the disc. The turntable motor unit is also impressive – from the heavy, dynamically balanced cast aluminium alloy platter and thick rubber mat to its aluminium plinth and steel base, the former separated by the latter by Pioneer’s clever ‘coaxial’ spring suspension system. Yes, this deck is just as ‘sprung’ as a Linn Sondek, yet it is very subtlety done and you would’t notice if you didn’t look for it – the arm, platter, bearing and motor hang from rubber coated internal struts (not dissimilar to SME’s Model 30), immune from the vibrations the platter and base pick up. The bearing housing is a robust alloy casting which encloses a finely machined spindle, and the motor a brushless, slotless linear design with a phase-locked loop quartz circuit that keeps wow and flutter down to a vanishingly low 0.02% WRMS. The sound is as slick as the ergonomics – it has a very smooth, open, neutral character which is far less showy and in-your-face than rival Technics direct-drive motor units, for example. Bass is superb, taut and tight and powerful and punchy, yet integrates beautifully into a wide-open midband; here you really begin to enjoy the effortless stability and rock-solid stereo imaging that a properly implemented parallel tracking turntable can bring. Treble is crisp, open and extended, giving an overall sound that is very similar to the master tape, and far less skittish than most conventionally armed turntables. In short, it is superb, and it’s all the more surprising become this comes from a fully automatic deck with a ‘weather eye’ on convenience. Needless to say, PL-L1000s are thin on the ground – many in the UK were skipped in the nineteen eighties when the magazines sniggered at the allegedly ‘awful’ sound of Japanese direct-drives, having only ever heard bottom-of-the-range designs, yet untroubled by making sweeping generalisations. Happily, there are a good few more still turning in Europe, the USA and Japan. Long may they run! I own this turntable, and it is in no way immune from vibrations. In fact, it is much, much, MUCH more susceptible to vibrations than my Pro-Ject Debut II. Every footfall causes the tonearm to skip unless the tracking force is doubled whatever the cartridge recommends. Even then, you can hear every footfall, and you can actually watch the left/right vibration that is induced into the tonearm. You’ve obviously never owned and used one of these turntables. Hi Charles – I’ve actually had three over the years, and am a big fan! If your deck picks up vibration the suspension is likely to be locked, and therefore the subchassis will not be floating as it should. If you press down on the platter half way between the spindle and the parked tonearm bearing pivot, does it bounce freely? If not, you can adjust the suspension using the concentric ring adjusters around the feet; the subchassis needs to be raised at all four corners so it can bounce. If this doesn’t work the rubber coaxial suspension will need renewing (they do harden and perish over time), which is a bit of a chore but perfectly do-able. Wow, that’s not supposed to happen! I never had any problems at all with mine (admittedly mine were Pioneers and not Phase-Linears). It would be interesting to know what cartridge you’re using. Have you tried it with other cartridges – there may be a compliance mismatch which isn’t helping? Also, the suspension rubbers have likely hardened (do you live in a dry climate? ), and this isn’t helping either. Also, is the deck 100% level and are the four concentric adjusters on the feet working as intended – sometimes they can slip out of their apertures? Finally, have you checked the tracking weight with a proper stylus gauge – it might be as simple as this? If all the above is okay, then it’s probably going to be necessary to dissemble the deck, partially, to see if there’s something obvious wrong, like a tonearm lead wire dragging, or suchlike. At the moment it seems like something is coupling the arm to the lower chassis (and ground) when it shouldn’t be! I can see why you’re frustrated, but I can assure you they don’t all do this. Pioneer used the same coaxial suspension on tens of thousands of decks (PL-600X, etc.) and they’d have gone bankrupt if this happened to every one. See if you can find anything amiss. One last point – the deck sounds much better with the dustcover removed; it would be interesting to see if doing this helps. Nice system, by the way! I’m using an Audio-Technica AT155LC, (Linear contact diamond stylus) which has been on for many years. 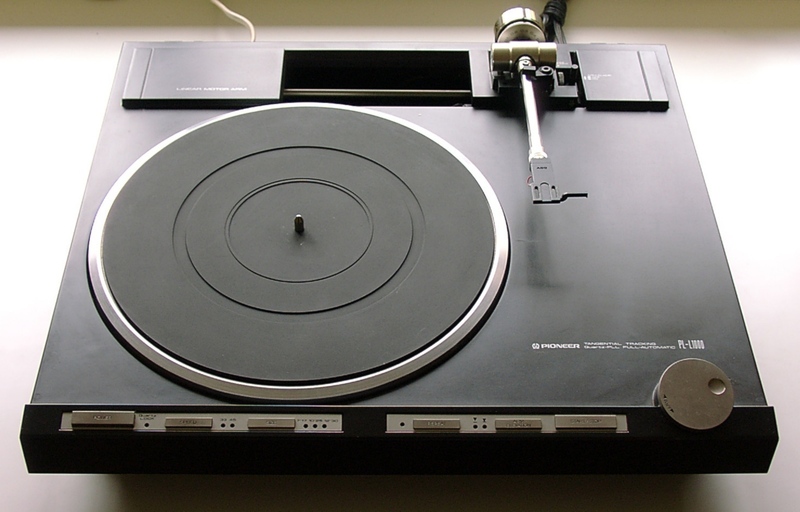 (This was my uncle’s turntable, and was used regularly until just a few years ago). I’m not in a particularly dry climate. I don’t have a stylus gauge, nor any way to properly mount a new stylus. I’ll have to take it to a shop to have that done, or buy a gauge and an alignment guide on eBay or something. The deck is level and the adjusters are there, but I don’t know what you mean by slip out of their aperture. It does this same thing even with 4 grams of tracking weight (the maximum), although to a slightly lesser degree. It doesn’t seem as if the tonearm is attached to ground. I can press on it and it moves up and down. Not really sure what gives. The elevation belt is broken or slipped off, so I’ll have to open it anyhow, but I’m not really confident this is broken. It seems to me like it’s just a poor design, because everything seems to be correct. Hi Charles – I can assure you the deck isn’t designed that way. You have an issue with your sample. They’re very complex, as you’ll discover when you open it up, and finely aligned. Something is obviously out of spec – hardly surprising given the age! Well, I have several cartridges I could try, on other turntables. I’d like to keep this cartridge, because it was quite expensive back in the day, and it does sound wonderful. Hopefully the suspension is fine. I’ll try swapping carts between this and my Sony PS-LX5, and see if that makes a difference. Answer me this. Play some vinyl, and then gently tap the underbelly of the turntable. Will that cause your tonearm to bounce up and down and the record skip? Removing the cover did help things by the way. It’s noticeably better without it installed. I’ll open it up and take a look at the rubber bits. Well sir, I started taking the turntable apart, and it wasn’t the suspension in the cartridge that was at fault. It was the platter suspension itself. It wasn’t that the rubber had hardened, it was missing entirely. It had all rotted away. Apparently that rubber boot over the spring acts much like a shock absorber for a car with coil-over suspension. With bad shocks, the car will just bounce around on the springs. That was exactly what was happening here, there was no dampening for any of the springs, which caused every little movement to be exacerbated and made worse by the wiggling of the spring. It’s also very unfortunate that those rubber dampers are discontinued, and cannot be found on ebay or any hifi audio site I looked at. To get the table playing, I wrapped the springs with electrical tape. This made a huge, amazing difference. It added significant damping to the spring, and I was able to dial back the tracking force and walk around without causing any skipping or tonearm oscillation. It’s not a permanent fix, though. Electrical tape doesn’t last long in warm enviornments, and I’m going to have to do this fix again. Either that, or remove the springs entirely, and replace them with nylon spacers. No suspension at all is better than undamped suspension. Good to know you’ve found that it is the concentric level adjusters, as I suggested in an earlier post. As I suspected the rubber suspension had dried out, although I didn’t think they’d dry out to the point of turning to dust. The deck must have been kept in a drier climate than mine. I used an automotive seal conditioner to swell the rubbers in mine, but it looks like yours are beyond repair! All is not lost, because you could easily buy some butyl rubber sheet, or similar, and cut out new ones. This done, you’ll be amazed how good it sounds, much better than your Pro-ject, especially with the cover removed. As you can now see, your deck wasn’t working as Pioneer intended! I would still look to replacing the cartridge when you have the funds. The cantilever is held on to the stylus body by a small rubber damper, and this will have dried out by now. It doesn’t matter what it looks like, any rubber of this age won’t have the physical properties of when it was new. This will effect the way the stylus tracks, and if it doesn’t trace the groove quite so well then it will wear the record, as well as sounding a little skittish or jittery. If you’re serious about the deck, then spend a few hundred dollars on an Audio-Technica AT-OC9. The AT-95E a good starter cartridge but the OC9 is amazing! Good luck, and I hope you’ll now agree that I do have real experience of a PL-L1000! Can I not just replace the stylus? I have the pioneer version of this table (someone left it behind at my dad’s rental property. They must be crazy). Mine is almost completely impervious to my two year old running and jumping near it. There is a guy in ebay by the name of Prof. Bizzt that specializes in these tables. He sells what are essentially replacement neoprene o-rings that go between the spring and the subassembly. They can be had for pretty cheap. It seems that the rubber boot that surrounded the spring was mostly unnecessary, but the rubber bushing/cushion on the end is required. The ebay ones are what I have and I don’t have oscillation or vibration problems. Also, for what it’s worth, I went to the hardware store and bought some cheap o-rings while I waited for mine to arrive from Prof. B. I noticed very little sonic improvement between the two, but the ebay ones fit much better. Doe anyone have the contact info for Prof. Bizzt? Cant find him on ebay. Alan seems to be the authority on these turntables. I’m looking to have him rebuild my original one that I purchased 40 years ago.